The blockbuster pay-per-view (PPV) main card of tonight’s (Sat., March 14, 2015) UFC 185 is in the books from the American Airlines Center in Dallas, Texas. In the main event, show-stopping lightweight champion Anthony Pettis went for his second title defense in three months versus surging contender Rafael dos Anjos. “Showtime” came out winging two high kicks, but dos Anjos countered with hard body kicks and a huge left hand that landed flush. Pettis countered the seemingly endless body kicks with sharp straight rights, but the damage was adding up as dos Anjos continued pressuring “Showtime”. The Brazilian ended the first round on top after a takedown. Dos Anjos pressed the action with more big left hands to start the second, but Pettis landed a big body kick. 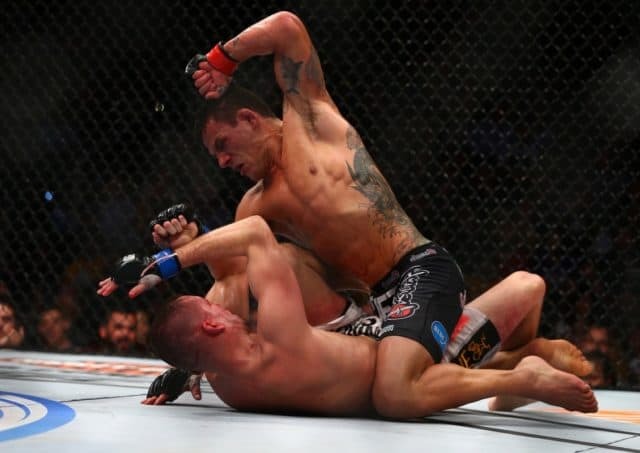 Dos Anjos took it to the ground again, smothering “Showtime” with ground and pound for the entirety of the round. In the third, dos Anjos landed another sharp left. The challenger ate a sharp head kick but threw one of his own, taking Pettis down yet again and kneeing his body when he got up. He took down Pettis two more times and ended the round with on his back. Dos Anjos landed a good combo to start the fourth, and Pettis hit him with two body kicks. But dos Anjos took him down yet again to go for a kimura and take Pettis’ back. The champion countered with a takedown of his own that “RDA” got right back up from, and the challenger ended the round on top. Dos Anjos continued his pressure in the fifth round, taking Pettis down for the eighth and ninth times to end the round with his back and win the UFC lightweight title belt in dominant fashion. In the co-main event, women’s strawweight champion Carla Esparza sought her first title defense against trash talking, in-your-face challenger Joanna Jedrzejczyk. “Cookie Monster” went for an early takedown that Jerdrzejczyk defended well, but the second attempt was momentarily successful. Jedrzejczyk began landing vicious strikes, landing a strong right that wobbled Esparza. She finished the round defending takedowns with elbows and winging hard punches. Jedrzejczyk kept it up on the second, blasting Esparza with swift powerful shots and staving off every takedown. She landed a huge right hand and a combo, following with endless shots to earn an unstoppable flurry to win the title via TKO. The next welterweight title contender could be decided when former champ Johny Hendricks hooked up with the always dangerous Matt Brown. Hendricks came out strong with two takedowns until Brown got up with a couple submission attempts and unleashed his trademark Muay Thai. Hendricks eventually got a third takedown to ride out the first round. Brown landed a big punch and a high kick to start the second, but Hendricks came big with a huge double leg. He landed ground and pound before a restart, following with combos and another takedown. Hendricks ended the round with some big punches and top control. Brown came out aggressive in the third, landing some punches. But he got taken down two more times, and smothered for the duration of the round aside from an inverted triangle attempt and some good shots from the bottom. “Bigg Rigg” took home a big unanimous decision win when it was all said and done. Hulking heavyweight strikers Alistair Overeem and Roy Nelson locked up in a crowd pleaser. Overeem was effective with huge knees to the body and leg kicks, following with a hard jumping knee to the face. “Big Country” began to tee off, however, and Overeem somehow survived. “The Demolition Man” dropped “Big Country” with a kick to the body, going to well with another knee and kick to the midsection to win the first. Overeem was winning the second but got hit with a straight right that wobbled him a bit until he fired back with another body kick. He continued working the body, scoring with a huge knee to end another winning round. Overeem scored again to start the third, but Nelson fought back with a big shot this time. Overeem landed two huge head kicks, some oblique kicks, and a body kick. “Big Country” dropped Overeem with a huge punch, but time ran out as he foolishly went for a takedown, and Overeem took home a unanimous decision victory. Kicking off the main card, Olympic gold medalist wrestler Henry Cejudo finally made the flyweight division limit of 126 pounds for his fight against recent No. 1 contender Chris Cariaso. Although Cariaso landed some stiff punches early, Cejudo stayed super aggressive with his strikes, getting a couple easy takedowns and scoring with numerous kicks and knees aside from a Cariaso body kick towards the end of the first. Cejudo got another takedown in the second, scoring with knees, punches, and another takedown to win the another round. Cejudo kept it up in the third, grounding Cariaso to bludgeon him with elbows to win an obvious unanimous decision.